When our town got it's new Chick-fil-A, you couldn't keep me away. The one big thing I noticed is all the plastic containers they use. From a small yogurt to a large salad, they have containers for just about everything. Some may see this as wasteful, but I see it as an opportunity. 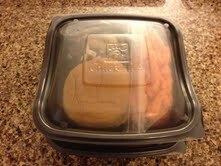 I love the salads at Chick-fil-A, but I also love that I can take the container home with me. It is a great solution to lunch boxes. The best part is that there's no worry if it gets lost or forgotten at work or school. Simply put in your sandwich and sides, or leftovers from last night's dinner and your ready to go. These containers are dishwasher safe. They are also microwave safe, and even have vent holes so you can keep the lid on while heating. Is there something you reuse at home? Please feel free to share your "take home" story with us by commenting below.